Download "EUROPEAN COMMISSION HEALTH AND CONSUMERS DIRECTORATE-GENERAL. 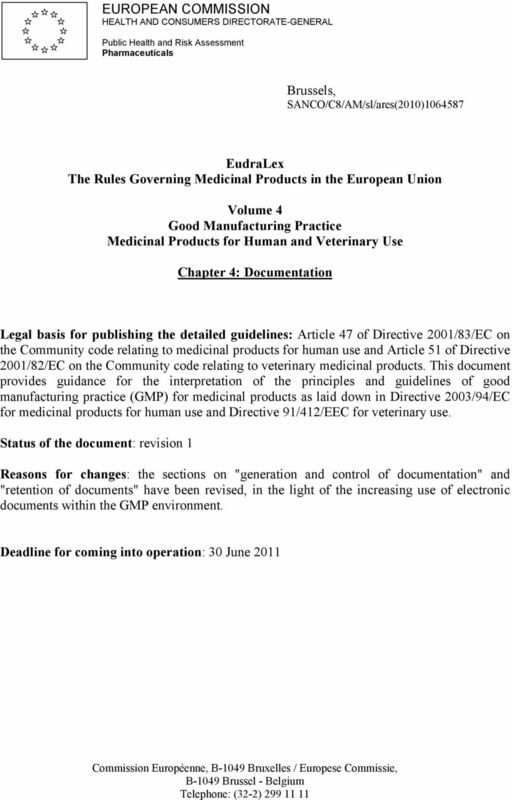 EudraLex The Rules Governing Medicinal Products in the European Union"
2 Table of Contents Principle Required GMP Documentation Generation and Control of Documentation Good Documentation Practices Retention of Documents Specifications Manufacturing Formula and Processing Instructions Procedures and records Principle Good documentation constitutes an essential part of the quality assurance system and is key to operating in compliance with GMP requirements. The various types of documents and media used should be fully defined in the manufacturer's Quality Management System. Documentation may exist in a variety of forms, including paper-based, electronic or photographic media. The main objective of the system of documentation utilized must be to establish, control, monitor and record all activities which directly or indirectly impact on all aspects of the quality of medicinal products. The Quality Management System should include sufficient instructional detail to facilitate a common understanding of the requirements, in addition to providing for sufficient recording of the various processes and evaluation of any observations, so that ongoing application of the requirements may be demonstrated. There are two primary types of documentation used to manage and record GMP compliance: instructions (directions, requirements) and records/reports. Appropriate good documentation practice should be applied with respect to the type of document. Suitable controls should be implemented to ensure the accuracy, integrity, availability and legibility of documents. Instruction documents should be free from errors and available in writing. The term written means recorded, or documented on media from which data may be rendered in a human readable form. 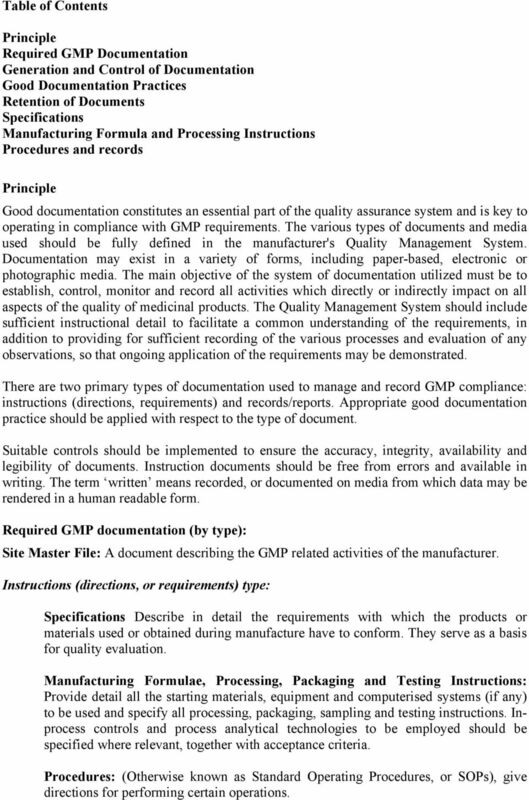 Required GMP documentation (by type): Site Master File: A document describing the GMP related activities of the manufacturer. Instructions (directions, or requirements) type: Specifications Describe in detail the requirements with which the products or materials used or obtained during manufacture have to conform. They serve as a basis for quality evaluation. Manufacturing Formulae, Processing, Packaging and Testing Instructions: Provide detail all the starting materials, equipment and computerised systems (if any) to be used and specify all processing, packaging, sampling and testing instructions. Inprocess controls and process analytical technologies to be employed should be specified where relevant, together with acceptance criteria. Procedures: (Otherwise known as Standard Operating Procedures, or SOPs), give directions for performing certain operations. 3 Protocols: Give instructions for performing and recording certain discreet operations. Technical Agreements: Are agreed between contract givers and acceptors for outsourced activities. Record/Report type: Records: Provide evidence of various actions taken to demonstrate compliance with instructions, e.g. activities, events, investigations, and in the case of manufactured batches a history of each batch of product, including its distribution. Records include the raw data which is used to generate other records. For electronic records regulated users should define which data are to be used as raw data. At least, all data on which quality decisions are based should be defined as raw data Certificates of Analysis: Provide a summary of testing results on samples of products or materials 1 together with the evaluation for compliance to a stated specification. Reports: Document the conduct of particular exercises, projects or investigations, together with results, conclusions and recommendations. Generation and Control of Documentation 4.1 All types of document should be defined and adhered to. The requirements apply equally to all forms of document media types. Complex systems need to be understood, well documented, validated, and adequate controls should be in place. Many documents (instructions and/or records) may exist in hybrid forms, i.e. some elements as electronic and others as paper based. Relationships and control measures for master documents, official copies, data handling and records need to be stated for both hybrid and homogenous systems. Appropriate controls for electronic documents such as templates, forms, and master documents should be implemented. Appropriate controls should be in place to ensure the integrity of the record throughout the retention period. 4.2 Documents should be designed, prepared, reviewed, and distributed with care. 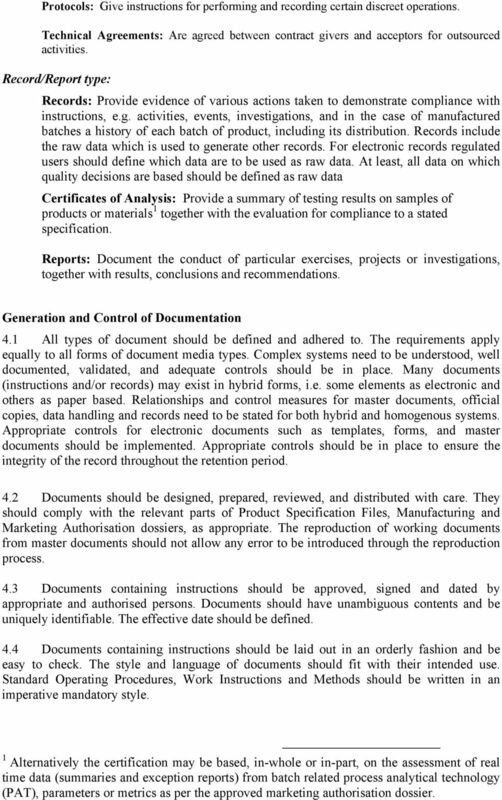 They should comply with the relevant parts of Product Specification Files, Manufacturing and Marketing Authorisation dossiers, as appropriate. The reproduction of working documents from master documents should not allow any error to be introduced through the reproduction process. 4.3 Documents containing instructions should be approved, signed and dated by appropriate and authorised persons. Documents should have unambiguous contents and be uniquely identifiable. The effective date should be defined. 4.4 Documents containing instructions should be laid out in an orderly fashion and be easy to check. The style and language of documents should fit with their intended use. Standard Operating Procedures, Work Instructions and Methods should be written in an imperative mandatory style. 1 Alternatively the certification may be based, in-whole or in-part, on the assessment of real time data (summaries and exception reports) from batch related process analytical technology (PAT), parameters or metrics as per the approved marketing authorisation dossier. 4 4.5 Documents within the Quality Management System should be regularly reviewed and kept up-to-date. 4.6 Documents should not be hand-written; although, where documents require the entry of data, sufficient space should be provided for such entries. Good Documentation Practices 4.7 Handwritten entries should be made in clear, legible, indelible way. 4.8 Records should be made or completed at the time each action is taken and in such a way that all significant activities concerning the manufacture of medicinal products are traceable. 4.9 Any alteration made to the entry on a document should be signed and dated; the alteration should permit the reading of the original information. Where appropriate, the reason for the alteration should be recorded. Retention of Documents 4.10 It should be clearly defined which record is related to each manufacturing activity and where this record is located. 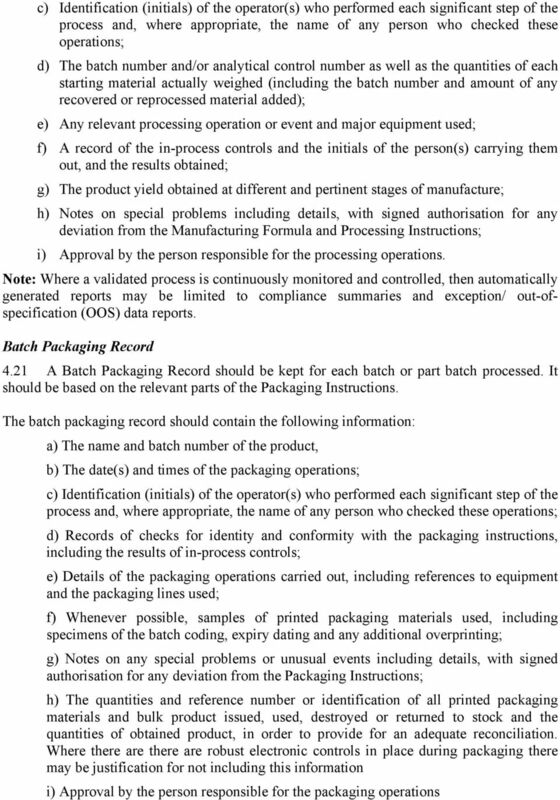 Secure controls must be in place to ensure the integrity of the record throughout the retention period and validated where appropriate Specific requirements apply to batch documentation which must be kept for one year after expiry of the batch to which it relates or at least five years after certification of the batch by the Qualified Person, whichever is the longer. 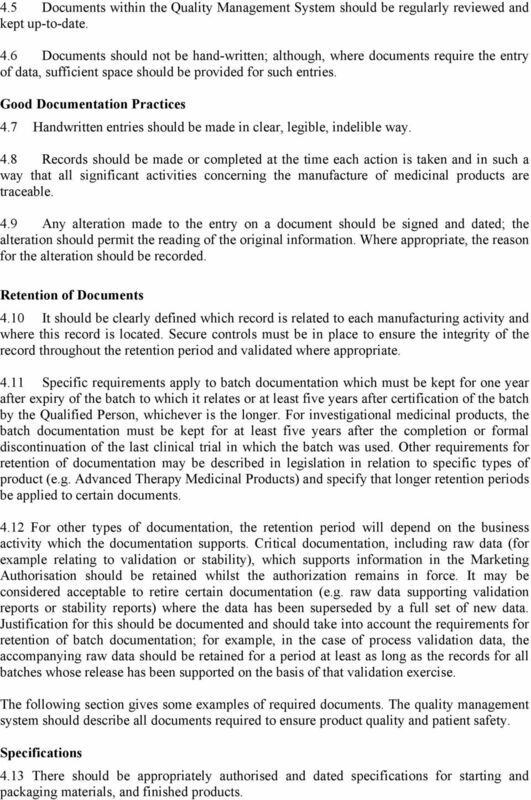 For investigational medicinal products, the batch documentation must be kept for at least five years after the completion or formal discontinuation of the last clinical trial in which the batch was used. Other requirements for retention of documentation may be described in legislation in relation to specific types of product (e.g. Advanced Therapy Medicinal Products) and specify that longer retention periods be applied to certain documents For other types of documentation, the retention period will depend on the business activity which the documentation supports. Critical documentation, including raw data (for example relating to validation or stability), which supports information in the Marketing Authorisation should be retained whilst the authorization remains in force. It may be considered acceptable to retire certain documentation (e.g. raw data supporting validation reports or stability reports) where the data has been superseded by a full set of new data. 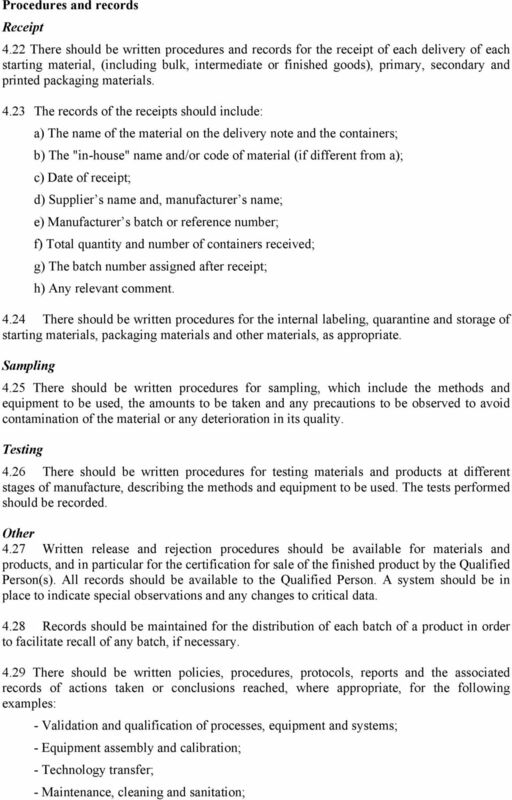 Justification for this should be documented and should take into account the requirements for retention of batch documentation; for example, in the case of process validation data, the accompanying raw data should be retained for a period at least as long as the records for all batches whose release has been supported on the basis of that validation exercise. The following section gives some examples of required documents. 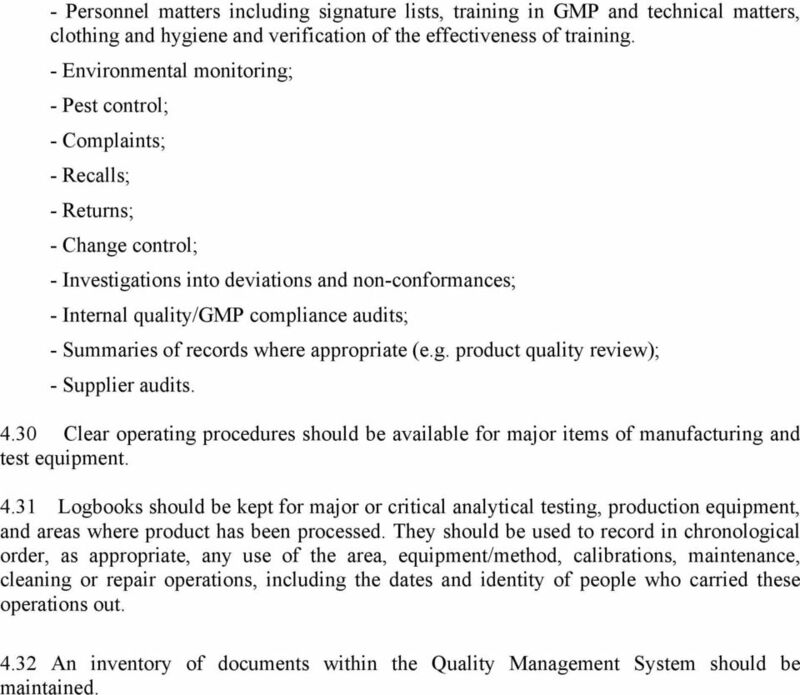 The quality management system should describe all documents required to ensure product quality and patient safety. 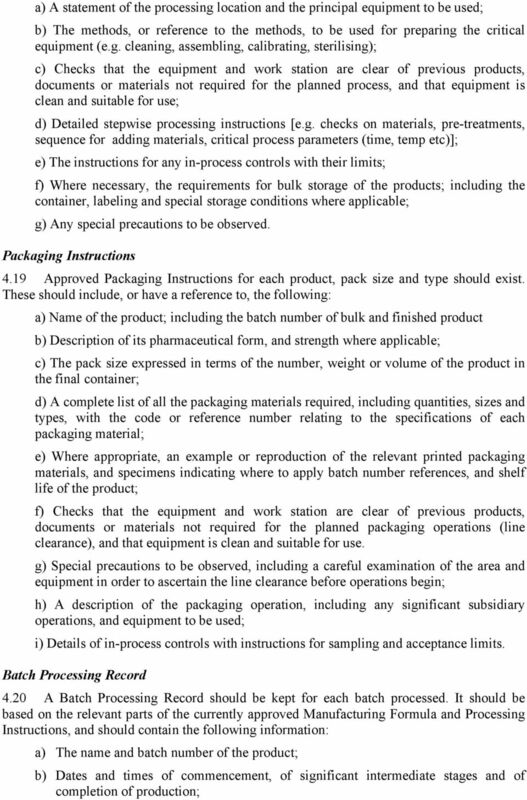 Specifications 4.13 There should be appropriately authorised and dated specifications for starting and packaging materials, and finished products. 9 - Personnel matters including signature lists, training in GMP and technical matters, clothing and hygiene and verification of the effectiveness of training. - Environmental monitoring; - Pest control; - Complaints; - Recalls; - Returns; - Change control; - Investigations into deviations and non-conformances; - Internal quality/gmp compliance audits; - Summaries of records where appropriate (e.g. product quality review); - Supplier audits Clear operating procedures should be available for major items of manufacturing and test equipment Logbooks should be kept for major or critical analytical testing, production equipment, and areas where product has been processed. They should be used to record in chronological order, as appropriate, any use of the area, equipment/method, calibrations, maintenance, cleaning or repair operations, including the dates and identity of people who carried these operations out An inventory of documents within the Quality Management System should be maintained. January 5, 2015 Dear Valued Customer, Since the implementation of new federal regulations, MeriCal Inc. has received a large volume of questionnaires and surveys regarding our services and procedures. 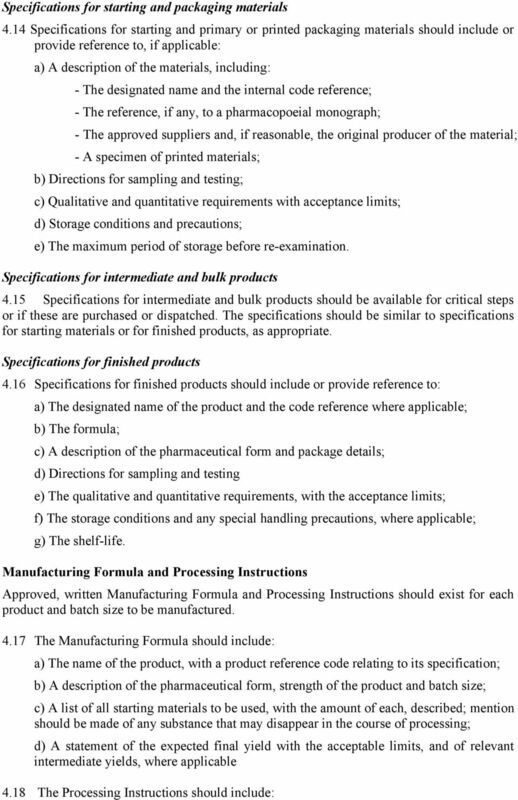 [SCHEDULE M] [See Rules 71, 74, 76 and 78] GOOD MANUFACTURING PRACTICES AND REQUIREMENTS OF PREMISES, PLANT AND EQUIPMENT FOR PHARMACEUTICAL PRODUCTS. RECOMMENDATION ON THE CONTENT OF THE TRIAL MASTER FILE AND ARCHIVING July 2006 TABLE OF CONTENTS Page 1. Introduction 2 2. Scope 2 3. Documents to be archived 2 4. Quality of essential documents 10 5. Specialties Manufacturing Talladega Castings & Machine Co., Inc. ISO 9001:2008 This document is the property of TMS and may not be reproduced, wholly, or in part, without the express consent of TMS. Rev. Guide to Quality System for General Sale Wholesale Distributors IA-G0038-2 1 NOVEMBER 2013 This guide does not purport to be an interpretation of law and/or regulations and is for guidance purposes only.